The next attempt at a pocket-sized PC came from Hewlett-Packard – but not from the PC division. In 1991, the HP 95LX came from the calculator division, squeezing 512kB of RAM, a 240x128 pixel (40x16 character) screen, MS-DOS 3.2 and a keyboard – complete with numeric keypad – into a pocket-sized, 310g device for $699. 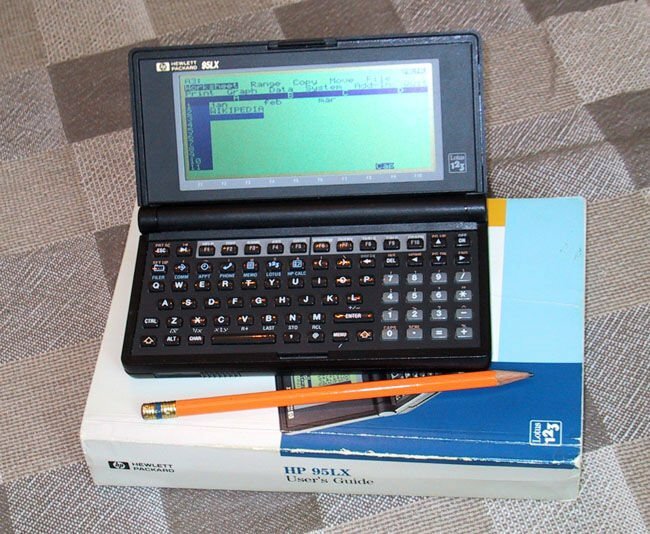 Essentially a pocketable Lotus 1-2-3 machine, it also included a sophisticated financial calculator app: HP calculators were the leading tools of their type at this time, and the top-spec model was half the price of the 95LX. The 95LX was a bigger success than any of its predecessors, selling 400,000 units – but it was still seriously constrained. It didn't have the spec to run full desktop apps and DOS was not a convenient OS for a "personal digital assistant". The device that redefined this category appeared later the same year – and like the Portfolio, it was British. Psion's first attempt to follow on from the Organizer range was a range of laptops in 1989: the MC200, MC400 and DOS-compatible MC600. The lower-end models ran Psion's own OS, EPOC, later retrospectively renamed SIBO to distinguish it from its 32-bit successor. SIBO was an impressive achievement – a complete multitasking GUI running on an 8086 with 256kB of RAM. The most desirable model, oddly, was the midrange MC400 model – but at £845, it was beaten by PC laptops. Psion's response was to re-engineer their device for a less-crowded market sector: the pocket. 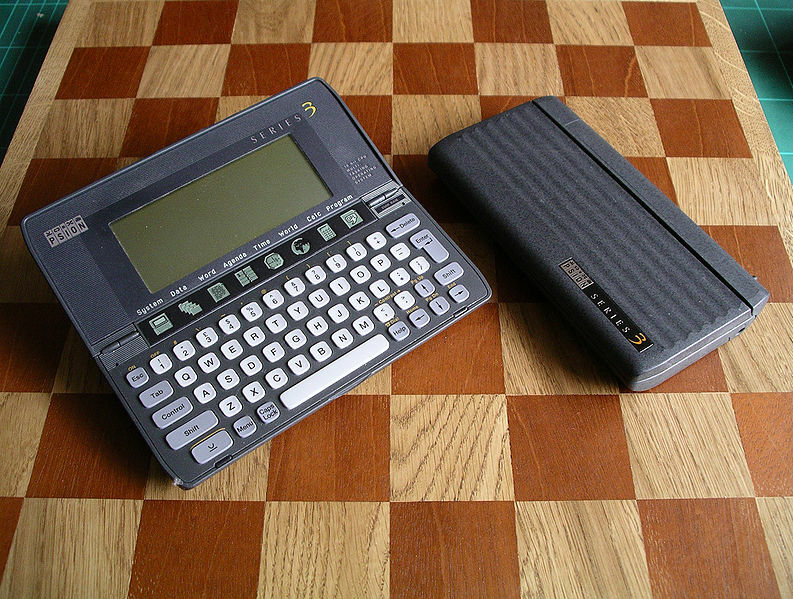 By the time the famed Psion Series 3 shipped in 1991, others had pioneered the trail of pocket-sized 8086 computers. Atari's Portfolio and the HP 95LX showed that you could create such a device for a reasonable price, but it was then too compromised to be a general-purpose MS-DOS PC, and the Poqet PC showed that whereas a no-compromise PC was technically viable, it ended up costing more than a laptop. Psion took a third direction – retaining and enhancing its proprietary OS but modifying the GUI for a small screen and keyboard-driven operation, and bundling it with a complete suite of apps in the ROM: a database, word-processor, spreadsheet with charting functionality, a world clock, a programming language and an Agenda program which to this day remains one of the best ever written for any platform. Compared to the DOS-compatible competition, it was another world: even the lowest-end 128kB RAM Psion 3 could flip between the graphical Agenda, address book and word processor programs with responsiveness and stability to provoke envy in the owner of a desktop PC with the then-current Windows 3.0. The screen was small, the keyboard a "chiclet" type, but the flexibility and power of even the £179 entry-level model was remarkable. Its hardware design was impressive, too, with a clever (if fragile) pivoting hinge that meant that both halves of the machine were thinner than its own batteries. When open, the upwards-facing part of the battery compartment had a touch-sensitive membrane containing a row of buttons for quickly launching or switching apps.